A group of Concordia University and UQÀM students are working together to denounce actions taken against student strikers in Spring 2015, which they call political repression. Over 25 Concordia students are about to undergo tribunals after receiving complaints from the university for disrupting classes through pickets and strikes, according to student activist group Solidarity Concordia. At UQÀM, nine students are facing expulsions, but only one has been formally expelled from the university. Students from both schools marched together Sept. 16 to demonstrate solidarity with classmates facing formal consequences for their involvement in the Spring 2015 anti-austerity student strikes. Wednesday’s protest started at the Place Pasteur on UQÀM’s campus. Students joined together to show their shared ideological stance on the political repression of students. About 100 protesters marched from UQÀM to Concordia, where the protest ended in the lobby of the GM building in which Concordia’s President Alan Shepard’s office is located. Last spring, some Concordia students voted in their respective student associations’ general assemblies to strike as a way to protest against the Quebec government’s austerity measures. Over 25 students participated in picket lines throughout the university and received formal complaints from professors for disobeying article 29 g)—“obstruction or disruption of University activities”—of the school’s Code of Rights and Responsibilities. Months later, Concordia joined the professors as co-complainants. 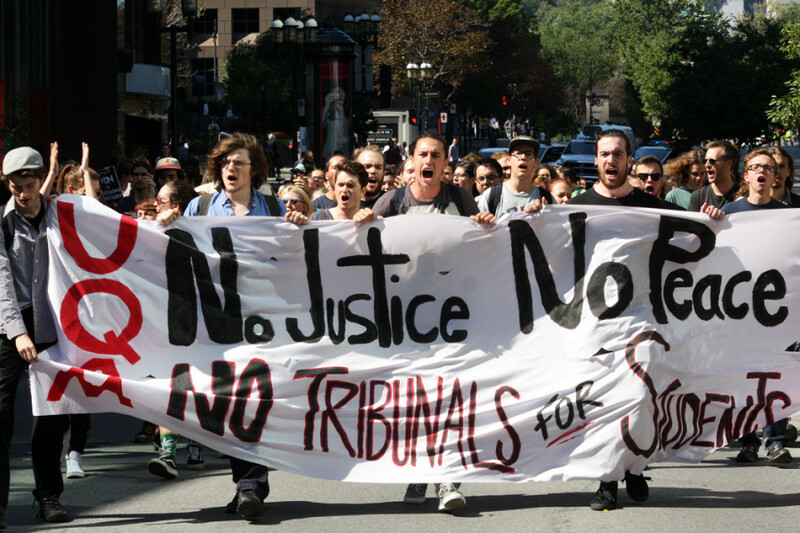 “They wanted to diminish a political movement that was democratically voted at general assemblies,” said Myriam Tardiff, spokesperson for a tribunal support committee formed out of Solidarity Concordia. The disciplinary tribunals could potentially lead to expulsion. Only one tribunal has a date set, which is scheduled for Sept. 29. According to Solidarity Concordia, the accusations are based on political discrimination and undermine the students’ democratic process. An online petition was launched to urge Shepard to cancel all strike-related charges against students. Today, the case around the 21 student arrests following the occupation of an UQÀM building in April is still unresolved. Members of L’Association Facultaire Étudiante des Sciences Humaines (AFESH) continue to fight and show their support for the targeted students, said Esther Paquette, secretary of the student association. Since the start of the new fall semester, months after the arrests and accusations, AFESH voted to go on strike on two separate days—Sept. 16, the day of the march, and Sept. 30, which is predicted to be the day of a teacher’s strike. One student, Justine Boulanger, was expelled and another, René Delvaux, was prevented from continuing his Master’s degree in political science. Some were released with a warning, and others are facing anywhere from a one-year suspension up to expulsion. Boulanger and Delvaux were the only two elected student members of the university’s Administrative Council—UQÀM’s equivalent of Concordia’s Board of Governors. “It is not random that we were both targeted and rejected,” Delvaux told The Link. Delvaux said he has been running into ideological conflicts with the Administrative Council for years. Since there are currently no students left on the board, all the progress made in terms of slowing budget cuts and other austerity measures were pushed back and ignored, he said. Samuel Cossette, another one of the nine students who faced expulsion at UQÀM, said administration targeted them randomly. He continued that they could’ve chosen anyone from thousands of students who participated in the strikes and demonstrations. As the case advances, it’s becoming more suspicious that the arrests were discriminatory, unwarranted and impolitical, according to Delvaux. “It was all an orchestrated strategy,” he said, echoing Cossette’s theory. The students didn’t have access to the evidence held against them before their hearing and didn’t have the right to be represented by a lawyer, according to Cossette. They were sent to the executive committee without being judged by the faculty first, which is the usual procedure, he added. The teaching community was stunned by the severity of the sanctions, Michèle Nevert, president of UQÀM’s teachers union (SPUQ) previously told Le Devoir last spring. Usually, students summoned by the disciplinary committee face suspensions not exceeding 15 days. The SPUQ thinks the penalties are a disproportionate response to the faults committed. Resolving the conflict through expulsions, tribunals and police force is a way for politicians to “break the collective action” and to silence those who want to exercise their right, Nicole Filion, Ligue des droits et libertés coordinator told Le Devoir. The university’s mission was perverted, she said. In an open letter signed last spring by a coalition of almost 100 professors and lecturers, the authors denounced the paradox of the student repression, writing that students are being punished for mobilizing against austerity measures, which will, in turn, threaten the very existence of the institution.